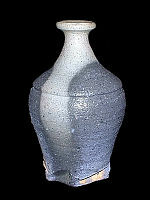 It appears that some things in the world of Japanese pottery are changing, and that is good. Traditions can stagnate if some new energy is not infused in century-old ways. 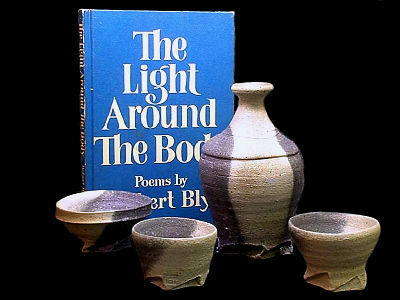 I find it quite refreshing to see younger potters exploring their chosen styles, and minds, to create something that is stretching the boundaries of ceramic art. Yet, hold on a minute -- I don't think change for the sake of change alone is necessarily a good thing. There must be grace in both form and firing to new works, for we don't need any more USA-influenced "artistic teapots" or the like -- look what happened to Kozuru Gen's work after his prolonged US residency! I just finished writing an article for an overseas ceramic magazine about one such Japanese potter who is definitely expanding the world of Japanese ceramics. He also had an exhibit here in Mishima (at the EY Net office) and I was surrounded by his work for a few months. Now that the works are gone I feel quite lonely without them. 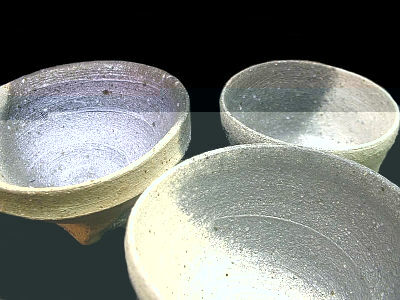 They stimulated my senses like a good friend and opened my mind to the further possibilities that clay can become when shaped by a sensitive artist, an artist like Mihara Ken. Mihara works in Shimane. His larger works have now found their way to collectors not only in Japan but overseas as well, due in part to his recent virtual exhibit at this site. His forms are all so unique, powerful and yet subtle at the same time. Take this tokkuri for example. The form is dynamic yet has a quiet aura about it. It looks very traditional yet also quite modern -- this is what I mean of infusing new energy into age-old forms or styles. Mihara has done this with his large works as well as his smaller items. Of course we can see the influence of Kamoda Shoji in some of his works, but that's not a bad influence at all! This tokkuri is all Mihara. The firing is his signature gray and blue color scheme that creates a delightful "landscape" with the gray being bordered by the blue sides. It reminds me of the river in Ogata Korin's "'Red and White Plum Blossom" screen. One smooth line near the shoulder and a gutsy carved base balance the sculptured work just right. The lip is perfect for pouring. 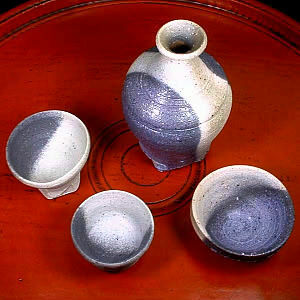 The three guinomi (see below) also have the same color scheme and Mihara's angularly cut kodai (foot), yet each one offers a unique personality. One is slightly elliptical and fits nicely in the hand as its form curves around the forefinger and thumb. This slightly elliptical guinomi is the thinnest in the throwing and it light and airy with a very fine, almost unnoticeable, covering of soft green specks. The smaller rounded cup is weighty and well balanced and has a presence that is beyond its size; it reminds me of Mihara's larger bowls. The lip is nicely angled -- not too thick and not too thin, just right. The open-faced guinomi has the most interesting tone of the three with an almost metallic sheen inside the guinomi. It's a very mysterious color. On this one the forefinger and the thumb fit snuggly in the groove around the outer portion of the lip. 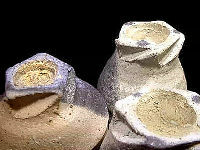 The kodai has more of a spiral motif inside and was dug deeper into the clay like a calligrapher wielding a brush. I only see Mihara becoming one of Japan's, and the worlds, most interesting ceramic artists -- that is already happening and can be easily seen in his wonderful shuki.